Ideally located at the north end of Scottsdale Road’s resort corridor, the 430-acre master-planned neighborhood of Kierland is a wonderful place to buy a home on the Scottsdale-Phoenix border. Surrounded by impressive upscale shopping centers like Scottsdale Quarter and Kierland Commons, this remarkable community surrounds the Kierland Golf Club and Westin Kierland Resort. 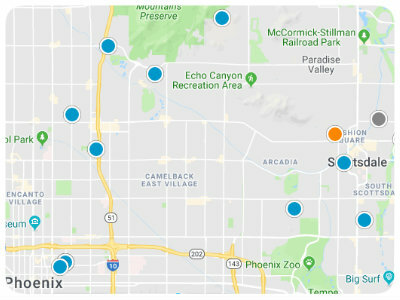 Because of its location and close proximity to these great destinations, Kierland affords its residents easy access to great recreation, excellent shopping and exquisite dining. Most Kierland homes were built by UDC between 1995 and 1998. Single family homes in this prestigious community can be one or two-story and range from 1,600 to 3,500 square feet. Those home buyers desiring something smaller will be pleased to know Kierland isn’t comprised of single family homes only. Kierland also has two noteworthy townhome communities, Kierland Greens and Kierland Heritage. Kierland Greens was built between 1998 and 2000 by Centex Homes. Townhomes in Kierland Greens range in size from 1,100 to 2,200 square feet. Kierland Heritage was built between 1997 and 1999 by Cachet Homes and has one-store and two-story townhomes ranging in size from around 1,600 to 2,400 square feet. Both of these remarkable townhome communities sit alongside the Kierland Golf Club. Kierland is also home to two contemporary loft buildings called the Plaza Lofts at Kierland. The Plaza Lofts are above the Kierland Commons shopping center and boast units ranging in size from 1,100 to 3,900 square feet. The Plaza Lofts were built between 2005 and 2008 and have numerous common area amenities and an on-site concierge. So, regardless of whether you are searching for the perfect loft, townhome or single family home, you’ll be impressed with the real estate options of Kierland in Scottsdale, Arizona. In addition to all of the great advantages listed above, Kierland residents also enjoy being just 2 minutes from the Scottsdale Airport, 7 minutes from the 101 Freeway, 10 minutes from the 51 Freeway and 15 minutes from Old Town Scottsdale. If you would like to buy a home in Kierland of Scottsdale, Arizona, please do not hesitate to contact us today for more information.